Next, you will complete the single-row layout, as well as the code that supports the Clear and Save buttons. Save the file, but do not close it. Review the effect of your last change. Click the first line of sample data. The single-record layout now displays the category name rather than an integer. When the user clicks Clear to remove nondefault content from the single-record layout, the clearAllFields function runs. The function sets up the layout so that when the user types data and clicks Save, the new typed data updates an existing database row. The code retains the record key for use in a subsequent update of the database. The code then creates a record, assigns it to the selectedPayment variable, assigns the saved key value to that variable, and publishes the variable to the single-record layout. A problem arises with the Dojo combo box for Description, because the widget content is of type STRING and the related field is selectedPayment.category, which is of type INT. The validation of the Dojo combo box requires that combo box include either integers or strings, such as "1" or "20," that can be converted to integers. Commits the validated data to the selectedPayment record. This "commit" is part of MVC processing and has nothing to do with a database commit. Updates the Dojo combo box in the single-record layout so that the value of that field is again a string. 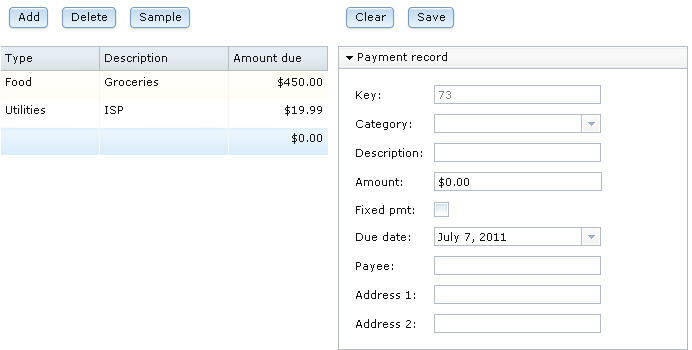 Revises the allPayments array element that contains the saved key value. At that point, the array element includes a copy of the data that the user wants in the database. Calls the service to update a single row in the database. The related callback function assigns the allPayments array to the data array of the data grid, and that assignment re-renders the grid with the updated data. 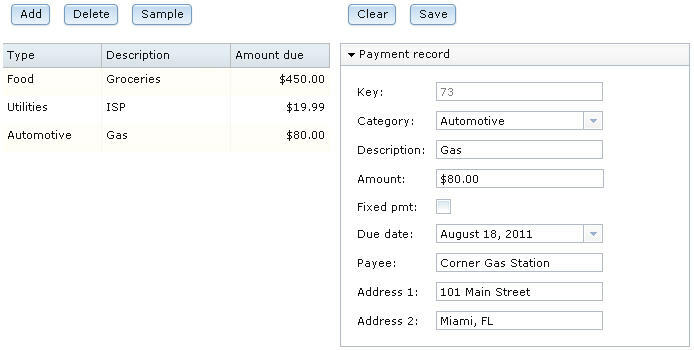 The grid will be re-rendered with data assigned in the selectedPayment_form_Submit function, not with data retrieved from the database. Now save the file, but do not close it. If you see errors in your source file, compare your code to the file contents in Code for PaymentFileMaintenance.egl after lesson 9. You can now test the completed application. Click the Preview tab. The sample data that you entered earlier is displayed. A key number is displayed. The Amount field shows a zero value. 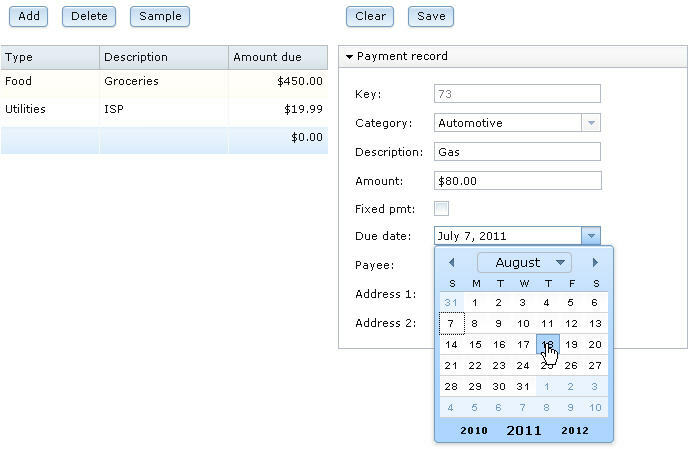 The current date is used as a default because the value of the DATE variable is null. Leave the Fixed pmt check box clear. 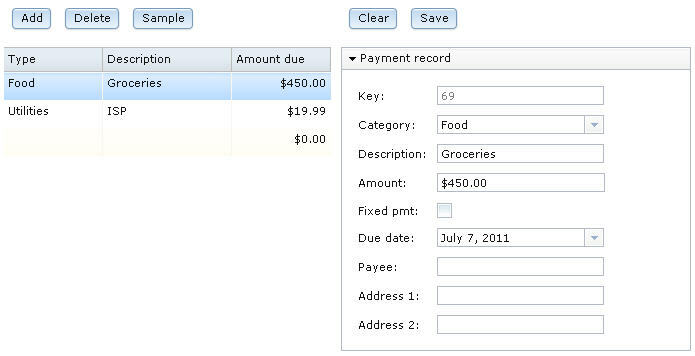 Click the current date in the Due Date field and select a date from the displayed calendar. For Payee, enter Corner Gas Station. For Address 2, enter Miami, FL. Click Save. The new data is stored in the database and is displayed in the data grid. Click Clear. The single-record layout is reset to initial values. Assign a preset string array as the set of values that are provided by a Dojo combo box. Use conversion functions if you need to relate a field of type INT to a Dojo combo box that contains strings. Use the Form Manager isValid and commit functions. In the next lesson, you install Apache Tomcat on your system so that you can run your application on a web server. This page was last modified 15:13, 30 November 2011 by Paul Hoffman.